Bilby (also known as the rabbit-eared bandicoot) is a rabbit-like marsupial. It lives in deserts, dry forests, dry grasslands, and dry shrubby areas in Australia. 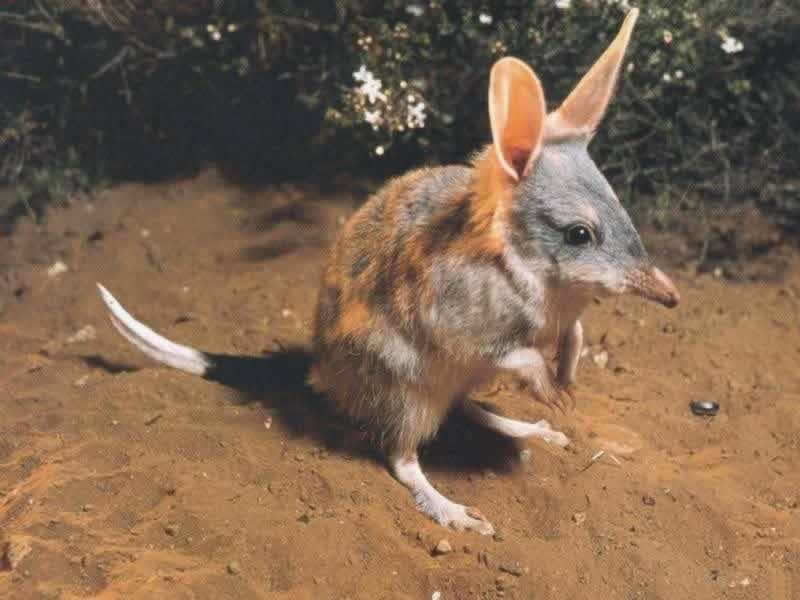 The bilby’s pouch faces backwards. These big-eared, burrowing mammals are in danger of extinction. The bilby, like all bandicoots, is a nocturnal animal (most active at night). Digging with its strong, clawed feet, this solitary mammal excavates long, complex burrows. Its underground dens are up to 5 feet (1.5 m) long. The bilby is about 15 inches (38 cm) long with an 8 inch (20 cm) tail. Its sense of hearing and smell are excellent but its vision is poor. : The bilby is an omnivore (eating plants and animals). It eats insects (like termites), lizards, mice, worms, snails, fruit, seeds, and some plants. The bilby needs very little water; it gets the water it needs from its food. It obtains food mostly at dawn and at dusk.